Believe it or not but your brain has the ability to change, adapt, and improve in more ways than one. Neuroplasticity is what it’s called when the human brain reshapes itself and its ability to learn new information improves. When most people think of brain improvement they automatically think deep breathing, meditation, and other similar exercises are the only way to make this happen. However, there are certain spices when eaten in the right capacity can help improve your memory, cognitive abilities, and overall brain power. Check out the 9 best spices to strengthen your brain. That’s right, black pepper is one of the most commonly used spices around the world and it’s also great for improving brain function. The pepper plant that produces black pepper is part of the Piperaceae family and it contains piperine, which acts as a thermogenic compound. Piperine is what makes black pepper a beneficial spice for the brain, as it will increase the production of beta-endorphin and serotonin in the human brain. Also, piperine will help prevent the enzyme that diminishes dopamine, which will lead to the prevention of mental related problems like Parkinson’s disease. Turmeric is a yellow colored spice that’s very popular in Indian cuisine. 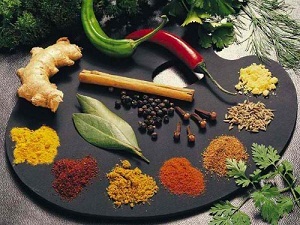 Most people aren’t aware that this spice normally used to spice up curries contains phytochemicals known as curcumin. Curcumin can help provide your brain the defenses it needs against brain related diseases, as it is an anti-inflammatory agent and a potent antioxidant. This is one of the reasons some researchers believe countries that eat turmeric regularly like India experience the least cases of Alzheimer’s. Add more turmeric in your daily diet by eating more curry dishes. You could also add raw turmeric to certain foods like egg salad or add some to your rice. Oregano is a popular spice that is packed with beneficial antioxidants known to help improve cognitive function and memory. Moreover, the antioxidants in oregano help protect your brain cells from degeneration of your neurotransmitters that are responsible for your cognition, sleep, appetite, and mood. Thanks to its ability to protect your brain’s acetylcholine sage can help improve your memory. Acetylcholine is a chemical messenger in your brain that is a major component of your memory. Also, sage will help protect your brain against Alzheimer’s and other brain related diseases. Thyme is a very popular spice often used in the culinary field for various dishes. Flavonoids and phenols are potent antioxidants in thyme that makes it great for protecting your brain from oxidative damage. Also, thyme oil can help prevent age related brain problems by increasing the amount of omega 3 fatty acids in your brain. Your nervous system and brain needs fatty acids in order to function properly. Thyme can also help protect you from developing Alzheimer’s disease, because its antioxidants help protect your brain from free radicals. Just like most of the other spices on this list, rosemary is packed with beneficial antioxidants and contains anti-inflammatory properties. Rosemary also contains a phytochemical known as carnosic acid, which will help protect your brain from free radical damage that will lead to brain related diseases. Cinnamon is another popular spice often used in baking and in some cooking. Cinnamon also has the ability to help prevent brain related diseases like Alzheimers thanks to compounds such as epicatechin, cinnamaldehyde, and proanthocyanidins. These compounds will help remove the tau proteins that will lead to the damage of brain cells. The smell of cinnamon will release certain compounds in your brain such as sodium benzoate that will help protect you from age-related neurological problems. Thanks to the myristicin compound that nutmeg contains, it has the ability to protect your brain from degenerative diseases like Alzheimer’s. Use caution when using nutmeg because this spice can lead to symptoms like hallucinations, vomiting, and nausea. Cloves are a very potent spice that contains a high amount of minerals, fiber, and vitamins. However, what makes cloves such a good mental stimulant are its antioxidant properties and a substance known as eugenol. Use clove oil to help stimulate your brain and make you more attentive. John writes on various topics aimed at helping to improve the health of people. He is a writer over at http://tonsilstoneremoval.org, which is a website dedicated to helping sufferers of tonsil stones.